The Chicago Blackhawks bludgeoned the Ottawa Senators on Tuesday night, and they made some remarkable history in the process. In the game, captain Jonathan Toews scored a pair of goals, and Patrick Kane also scored a goal as the Blackhawks picked up an 8-2 win. 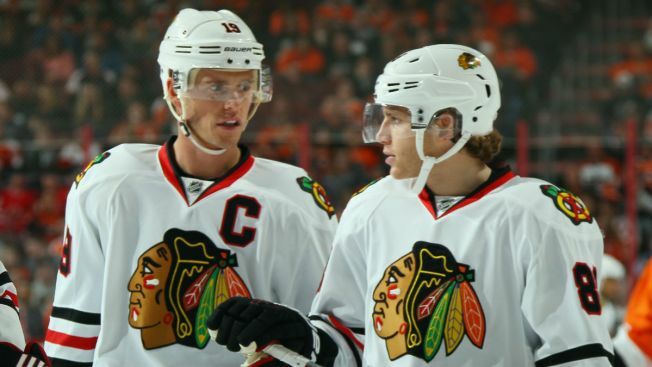 The game marks the 83rd time that Toews and Kane have scored in the same game, and it also marks the 40th consecutive game that the Blackhawks have won when the duo have both put pucks into the net. According to the Elias Sports Bureau, that 40-game winning streak is the longest in NHL history for a pair of teammates winning games in which they’ve both scored. According to NBC Sports Chicago’s Christopher Kamka, the Blackhawks are 73-6-4 in those games. The day was also historic for Kane, who set a new career high with five points in the victory. He picked up four assists in the victory, giving him a team-high 27 on the season. He is also just three points shy of hitting 800 for his career.